If you need proof the United States is a dangerous place to live – crime aside – just take a look at the massive scope of U.S. infrastructure problems. CBS's "60 Minutes" highlighted this plight Sunday with a feature on how our roads and bridges are decaying, how our airports have become antiquated, and how our seaports are heading for extinction. "Our infrastructure is on life support right now," Ray LaHood, former secretary of transportation during the first Obama administration and a former seven-term Republican congressman from Illinois, told "60 Minutes." "You could go to any major city in America and see roads and bridges and infrastructure that need to be fixed today." U.S. infrastructure problems are so bad, the country has slipped from having the world's best infrastructure to No. 16, according to the World Economic Forum. That's why LaHood, currently co-chairman of Building America's Future, a bipartisan coalition of current and former elected officials, is pressing for more broad-based funding for infrastructure spending needed in every state. Public spending on infrastructure has shrunk to its lowest level since 1947. Here are some of the numbers "60 Minutes" presented – plus a few we dug up on our own – that show the sorry state of U.S. infrastructure. 70,000: The number of bridges in America – one out of every nine – deemed structurally deficient. A structurally deficient designation means a bridge needs to either be replaced or repaired in a "dramatic" way. 4,000: Number of bridges (20%) in Pittsburgh alone that are structurally deficient. That includes the city's key bridge – the Liberty Bridge. Five million people in Pittsburgh cross bridges daily that need replacing or major repairs – a little ironic in the "City of Bridges." 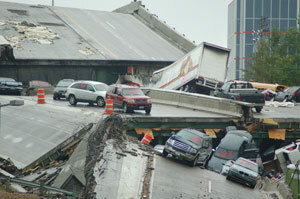 13: The number of people who died when the I-35W bridge over the Mississippi River collapsed Aug. 1, 2007, in Minnesota. Another 145 were injured. It happened during rush hour. A National Transportation Safety Board report on the cause of the crash indicated a ripped sheet of steel that was too thin led to the collapse. I first read stories about neglected infrastructure investment back in the 1980's in News and World Report. The story itself is old. Remember the levees in New Orleans were first constructed by the U.S. Army Corps of Engineers but maintenance was handled by local districts who evidently pocked the money for other purposes. That also is one reason why the U.S. Highway Trust Fund is running low, again, nothing new. The usual solution is always the same in Washington D.C. then and now: Raise Taxes ( Gas Tax). Never reduce spending. Never ending scam. Money seems to just "seep" out of these various "dedicated" Federal Trust Funds and maintenance is not a vote getter while entitlements and Food Stamps (EBT) Payments definitely are. Add to that forgiveness of Student Debts ( Loans) if you take a job with the government. These actions get votes, while maintenance gets little coverage until something fails or breaks. Then the story is reincarnated again and again.